Making a Visual QR Code is quick and easy and take three simple steps. First you need to upload the image you want for your QR Code (you can also use one from free from our Gallery). Than you need to select your QR Code destination, and finally to indicate where you want your QR Code to be positioned onto your image. The Visualead's Visual QR Code Generator would than automatically integrate the QR Code onto your image. 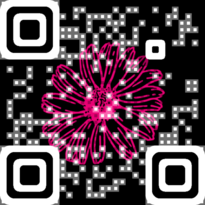 You can use Visual QR Codes to lead users to social pages such as your Facebook page, your Twitter account, and more. In the example below a Twitter Visual QR Code was used on an ad. When people scan the ad they can tweet about the ad to their friends. This is an example of using a QR Code on a billboard ad. The Visual QR Code was smartly put on the 1 + 1 text to indicate to the audience that whoever will scan the Visual QR Code would probably be directed to a 1+1 discount on the displayed hamburgers. Visual QR Codes can be used on any image and on products as well. In the example below a Visual QR Code was integrated to a corn flakes package to direct users to the morning news feed when scanned.